peas and carrots, carrots and peas – Naming a blog is harder than naming a kid. Owen and I have been working with a tiny garden. Owen loves peas and carrots, as well as some other vegetables, but this batch is easy, he can pick whenever he likes, and every couple of weeks we can sprinkle carrot seeds into bare patches. 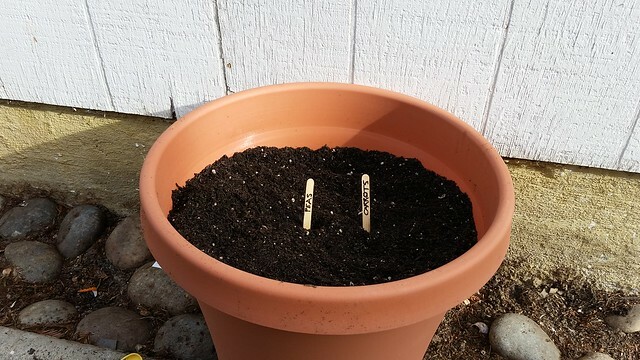 We have to plant it well into our front yard rather than back because it needs to be in a sunny spot and convenient to water, as well as away from the carrot-loving dogs, who would dig up their own snacks. We’ll irrigate it with a sprinkle can, I think, with both fresh and occasional water left over from household use. 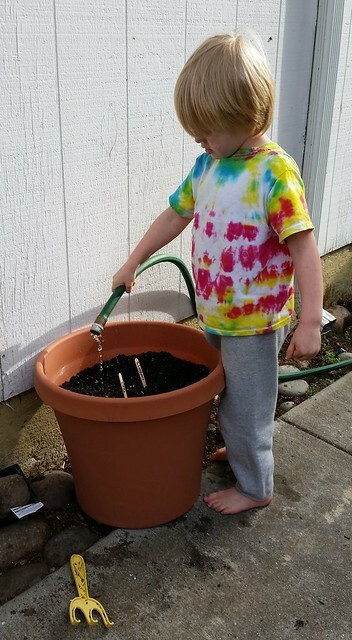 …is that I’d like to find ways to help Owen learn about water conservation, and giving him ways to practice it in daily life is a good way to do that. We can turn off water while brushing teeth, and not refill the tub immediately after a long soak, and turn off the hose when we’re done playing outside, but I think actually using water to make food grow, watching the process every day, is a solid, practical water experience. I love that he’s old enough not to want instant gratification with the seedlings sprouting, and the carrots and peas ripening. I’m just not sure I am!